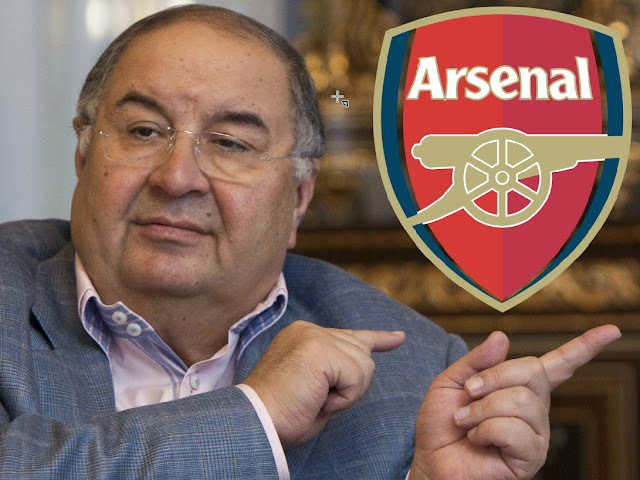 Alisher Usmanov, the Russian billionaire who owns a minority stake in Arsenal, "in recent weeks" made a $1.3B bid to buy out his rival shareholder, three people close to the situation said, according to Massoudi, Jenkins & Binham of the FINANCIAL TIMES. Usmanov, a metals magnate who owns 30% of the club, "conveyed the offer" in a letter to Stan Kroenke, who controls a 67% stake. The approach, made last month, valued the club at $2B. Kroenke is understood not to have "dismissed the idea out of hand at first." However, "he has since informally indicated he is not interested in selling" to Usmanov or "anyone else." A source said, "Two weeks ago, I thought something could realistically happen. Now I am not so sure." Two people "following the process closely" said that "other bidders were circling" (FT, 5/19). In London, Matt Hughes reported Usmanov's takeover bid failed after Kroenke "made it clear that he will not sell his controlling interest in the club." Kroenke is "yet to formally respond to Usmanov’s bid, but has let it be known that he has no interest in selling." Usmanov, who owns 30% of the club after buying Farhad Moshiri’s 14.6% stake for £75M last year, "has sought to exploit the financial pressure on Arsenal" with an offer worth £35,000 ($45,500) a share. Usmanov "has a contrasting vision for Arsenal to Kroenke, who has barred him from a seat on the board, and has argued that greater squad investment is needed." Usmanov said last month that "the blame for the club’s poor performance this season should not rest solely" with Manager Arsène Wenger, but also with Kroenke and the rest of the board (LONDON TIMES, 5/20). THE BIG QUESTION: In London, David Hytner reported Arsenal "endured a turbulent season" and missed out on its "traditional top-four finish." The issue of whether Wenger "ought to continue into next season" has polarized the fans. Usmanov "has made it clear in his various public statements he wants what is best for the team and is willing to bankroll Wenger" -- or whoever is the manager -- "to the tune of mega-millions to return them to the top of the table" (GUARDIAN, 5/19). In London, Jeremy Wilson reported there was "no real expectation that Kroenke would sell but Usmanov does remain open to negotiating." The offer to Kroenke valued Arsenal at £1.53B ($2B) and the "huge potential profit underlines how the club’s worth has more than doubled" -- allowing also for the "changing exchange rate" -- in the past six years. On the Wenger question, "which is the big issue facing Arsenal just now, Usmanov’s approach is not substantially different to that of Kroenke." His esteem for Wenger is "also very high and, while he is not saying that the Frenchman should be sacked, he does think that he takes on too much." Arsenal seems "to agree." The club wants to appoint an "operations/sporting director" and is in the process of "reassuring Wenger that such an appointment would not cut into his core role" (TELEGRAPH, 5/20). CHANGES COMING? : The BBC reported former Arsenal player Ian Wright said that the club "needs the spending power of a billionaire such as Usmanov," adding that "something has to change." Wright: "He has put in the bid and it is great news. Something has to change, whether it is the manager Arsène Wenger or whether it is the board upstairs" (BBC, 5/20).